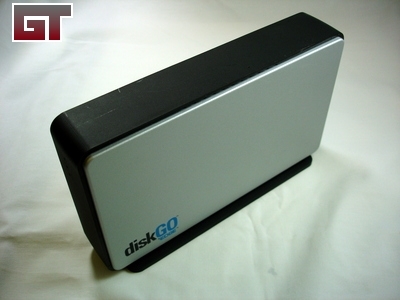 There's an abundance of external hard drive enclosures on the market today. From our recent reviews, you can tell there's an army of manufacturers out there to satisfy your storage needs. Whether you need something ultraportable in the 2.5" form factor or you need RAID'ed discs, it's out there. Today we've got something that's hopefully a little different than the rest. 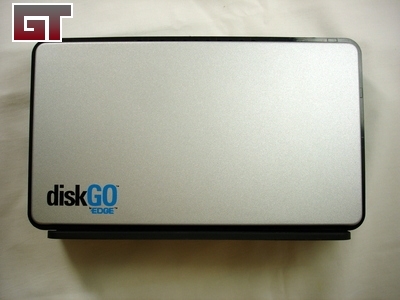 On the review block is the EDGE DiskGO 160GB Network Hard Drive. Now before you go and say "oh no, not another enclosure review", this one has something that most barebones HDD enclosures don't. 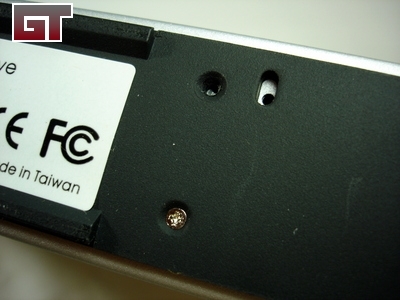 It has the ability to be networked directly from your switch or router without needing a host machine. 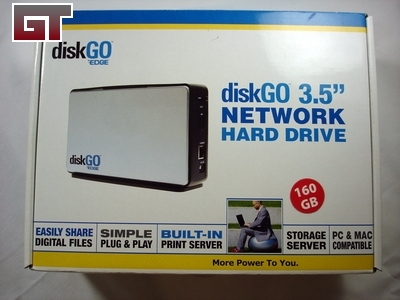 So essentially you plug this in and everyone on your network has access to this drive which is useful in many ways. "EDGE Tech Corp, an ISO 9001:2000 certified company founded in 1986, is a leading supplier of DRAM and Flash memory upgrades, portable computing products, storage devices, and other experience-enhancing technology solutions. At the age of 14, EDGE's president and CEO Jeff Thompson began the company with $2500 he had saved from a newspaper route. Today EDGE is one of the largest and most respected companies in its industry. EDGE is a channel-focused manufacturer, building long-term partnerships with distributors and resellers who demand the highest level of service and support from their vendor-partners. EDGE's DRAM-based memory product line offers upgrade solutions for desktops, notebooks, servers, printers, hubs and routers. EDGE's flash card lineup allows users of digital cameras and MP3 players to upgrade the devices' memory for maximum performance. The card line consists of various formats including CompactFlash, SD Memory Cards, SmartMedia, MultiMediaCard, and xD Picture Cards. A line of card readers provides convenient interface between the cards and a computer. EDGE digital media products allow users of digital cameras and MP3 players to upgrade the devices' memory for maximum performance. 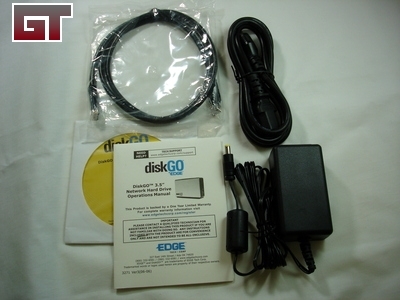 The company's popular DiskGO by EDGE brand includes USB flash drives, portable hard drives, and USB watch drives." 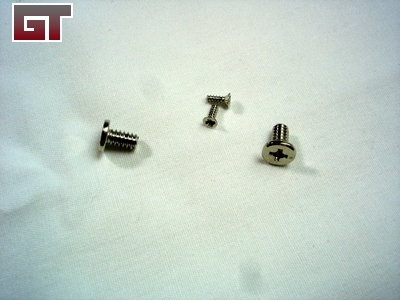 I heard some rattling and it appears there are some extra screws in the box as well. 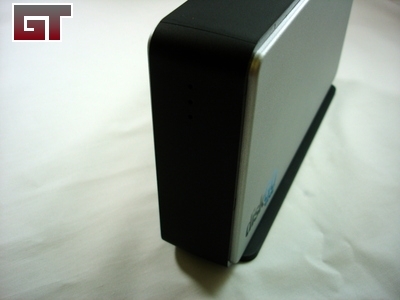 The enclosure has a brushed aluminum finish on the outside. It also comes with a very small stand to keep it upright. 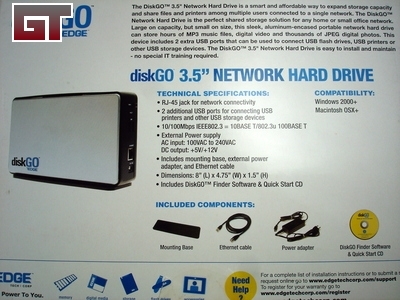 The front of the DiskGO has three small LEDs to show power (green), network connectivity (blue), and drive access (amber). You can't see anything in the below picture due to the sizing and angle of the DiskGO but there will be powered on images later in the review. 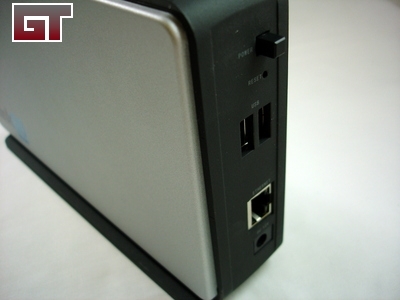 The rear of the unit has the power button, reset pin button, two (2) USB ports, 10/100 RJ45 ethernet port, and the power plug port. After examining the DiskGO, I found out where one of the tiny screws were supposed to go. It didn't pose any problems, I just screwed it back in and placed the stand back on.